Now it’s time for things to get fun. Part 1 and Part 2 in this 6-part fresh tomato soup series were fairly straightforward. Delicious and comforting for sure, but not entirely unfamiliar. Because let’s face it, tomato soup isn’t exactly the most exotic soup in the world. Well that changes starting today with part 3 for a Thai tomato soup recipe. Now that’s probably not too surprising if you follow Fearless Eating regularly. 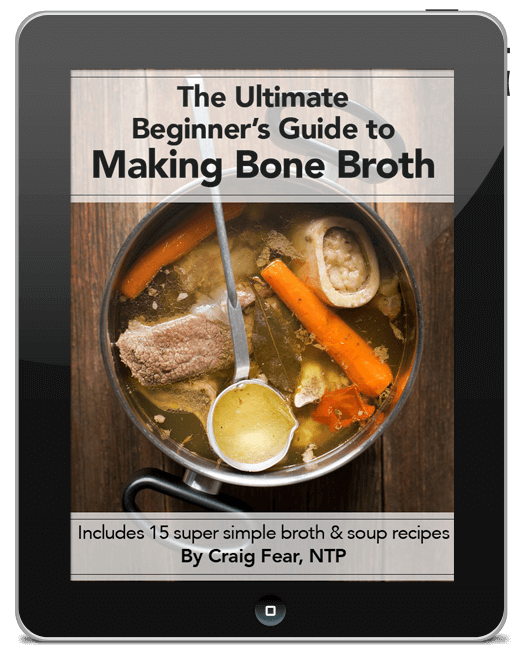 I did write a book on Thai soups after all, called The Thai Soup Secret. I’ll also say that parts 4 through 6 will get even funkier with tomato soup recipes inspired from the cuisines of India, Japan and Burma! 1.The classic trifecta of Thai herbs are great to use but not essential. That would be lemongrass, galangal and kaffir lime leaves which are pictured above on the lower left. They’re not essential because they’re in the red curry paste (pictured right next to them). However, canned curry pastes are not as flavorful as freshly made curry pastes (which are time intensive). That’s why I like to reinforce those flavors by adding their fresh counterparts. You’ll find all three of them in Asian food stores. If you don’t have one near you, they’re also available on Amazon. Ingredients links are provided in the printable recipe below. 2. Try to find Maesri red curry paste. I prefer it over the more popular Thai Kitchen brand curry pastes. But it’s fine to use Thai Kitchen red curry paste. As a side note, if you enjoy cooking Thai food at home, Maesri has a much larger selection of curry pastes than Thai Kitchen. You can see some of their products here. 3. Coconut palm sugar in a paste or syrup form is better than granulated form. Pictured on the upper left, it has a rich, caramel flavor and is the traditional type of sugar used in southeast Asia. My post 5 Reasons Why It’s OK to Eat Natural Sugar explains a little more about this type of sugar. You may find a brand in places like Whole Foods. Otherwise, this is a good brand for sale on Amazon. You can use granulated coconut sugar if you’d like but just know the paste form is superior in flavor. 4. Aroy-D coconut milk rocks! I just love it. It tastes richer and creamier to me than other store-bought brands. It’s sold in modern paper packaging (the green carton pictured above) to eliminate BPA contamination that often comes in cans. There’s no stabilizers, thickeners, gums, or preservatives which you see in a lot of other coconut milk products sold in the US. And it comes from Thailand! You can find it in most Asian food stores or right here on Amazon. 5. Golden Boy fish sauce rocks too! Thai fish sauces are not as intensely flavorful as other types, especially Vietnamese brands, and that’s actually a good thing. Golden Boy is my favorite brand of Thai fish sauce and works really well in Thai soups. 6. Try to find Thai basil. Pictured on the lower right is Thai basil. You can use regular basil but it’s not quite the same. Thai basil has an anise flavor which is just so perfect for Thai cuisine (I guess that’s why it’s called THAI basil). Asian food stores will certainly have it. You might also find it in some specialty markets. I’ve also seen it in at some local farmers markets recently. Step 1. Core and roughly chop your tomatoes. Use any type of tomatoes you want but remember, the true purpose of this series is to use FRESH, local tomatoes that are in season! I used a mix of heirloom and plum tomatoes. Also, it’s a good habit to peel the skins and de-seed tomatoes before using them. There’s multiple ways to do this. My friends Margaret and James of the awesome food blog, Eat Naked, have a great short video, How to Peel and De-Seed a Tomato, which goes through the different methods (and reasons why). Step 2. Infuse the tomatoes with fresh Thai herbs. Again, this step is optional but highly recommended. To prepare lemongrass, slice the stalk in half (and discard the upper half). Lightly pound the bottom half with a blunt kitchen utensil to release the oils (and thus the wonderful aroma). Chop off the base and then peel off a few outer layers. Then slice it into about one inch pieces. For the galangal (also called “Thai ginger”) peel and slice it into small rings. And for the kaffir lime leaves, scrunch ’em up to help release the oils and then rip them in half. 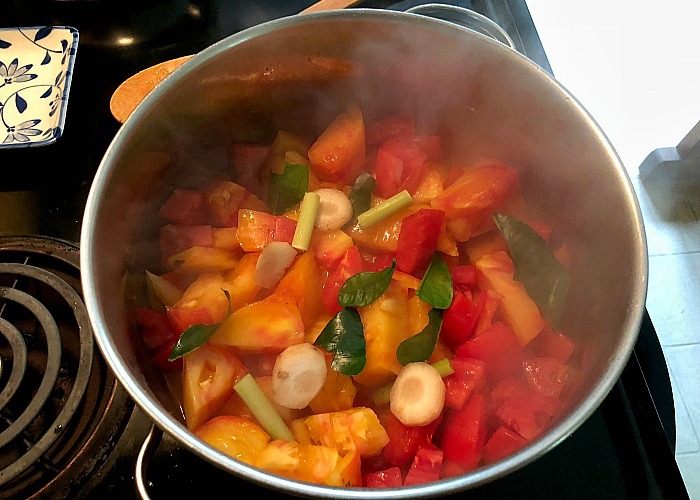 Heat some coconut oil in a stock pot and then add your tomatoes, lemongrass, galangal and kaffir lime leaves and cook for about 15 minutes, stirring on occasion. Tomatoes should release quite a bit of their liquid and take on the flavor of the herbs. Step 3. Add coconut milk and 1 TBSP red curry paste and simmer another 5-6 minutes. After simmering, taste and add more red curry paste, if desired. I find 2 TBSPs is just about right for me. Red curry paste is made with red Thai bird’s eye chiles so it can be pretty spicy for some people. Just start slow and add more as needed. Step 4. Add sweet, salty and sour flavors and the Thai basil. Once you get the right spice level with the curry paste, it’s just a matter of adding and balancing the other flavors. Thai cuisine is all about balancing the 4 S’s – spicy (already inlcuded via the curry paste) sweet, salty and sour. This is where coconut sugar, fish sauce and lime juice come in. Suggested amounts are in the recipe below but feel free to add a little more or less of each, to your taste preferences. Once you get that right, add in your Thai basil leaves. Step 5. Puree everything together until smooth with an immersion blender. If you don’t have one, please get an immersion blender. I’ve had this cheap one for many years and it’s been more than adequate. Otherwise, you’ll have to use a regular blender which takes a lot more time and can make a big mess. Step 6. Season individual bowls to taste. About that last one. I had some homemade garlic-chile-vinegar leftover from my Hanoi pho recipe post. Turns out it was a natural fit in this recipe. To make it, simply take 2-3 cloves of garlic, crush them slightly, split one or two Thai bird’s eye chiles and then add a quart cup each of rice vinegar and water to a small glass jar. Cover and put it in the fridge for a day to meld the flavors. Adding some protein and starch will make it a lot more substantial. This is totally optional. Seafood and any type of rice noodle or white rice served on the side is a good fit. I added shrimp and vermicelli rice noodles to the full recipe below. 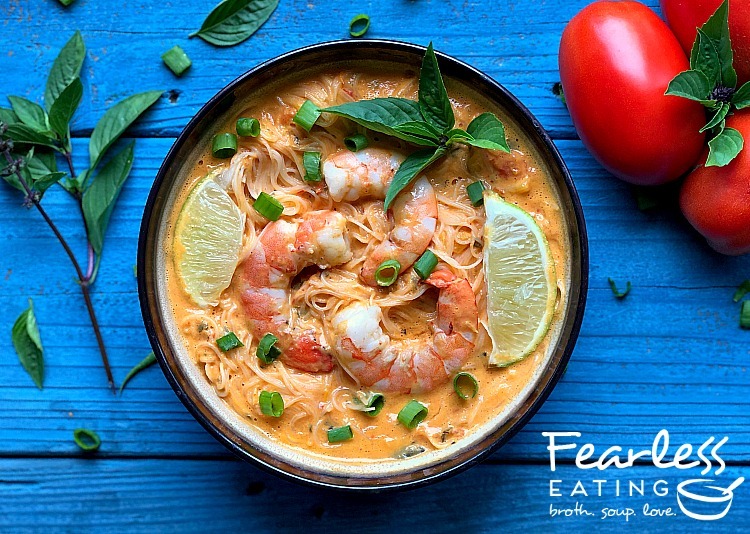 Thai tomato soup is a fun fusion between a classic tomato soup and a Thai coconut curry. 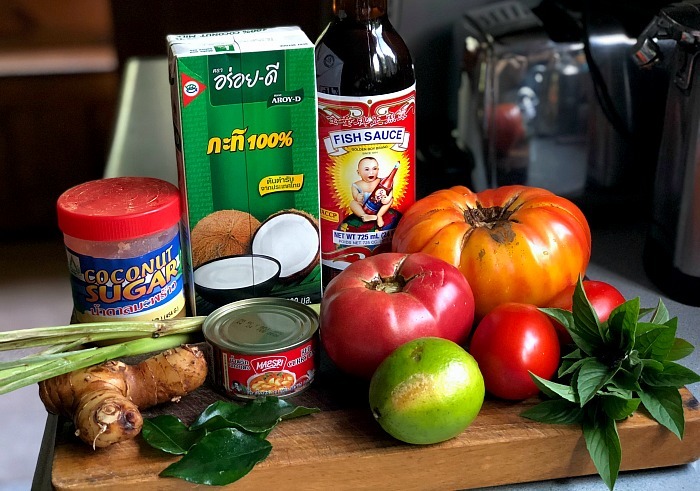 Simply saute some tomatoes in coconut oil and the rest of the soup is made in the traditional Thai style with classic Thai flavors of lemongrass, galangal, kaffir lime, chiles, fish sauce, lime and sugar. Core and roughly chop tomatoes. Heat coconut oil in a stock pot and add tomatoes, lemongrass, galangal and kaffir lime leaves and cook for about 15 minutes, stirring on occasion. Tomatoes should release quite a bit of their liquid. Add coconut milk and 1 TBSP red curry paste and simmer another 5-6 minutes. Taste and add another TBSP red curry paste, if desired. I find 2 TBSPs is just about right. Remove about a cup of the soup into a small bowl and add coconut palm sugar and dissolve. 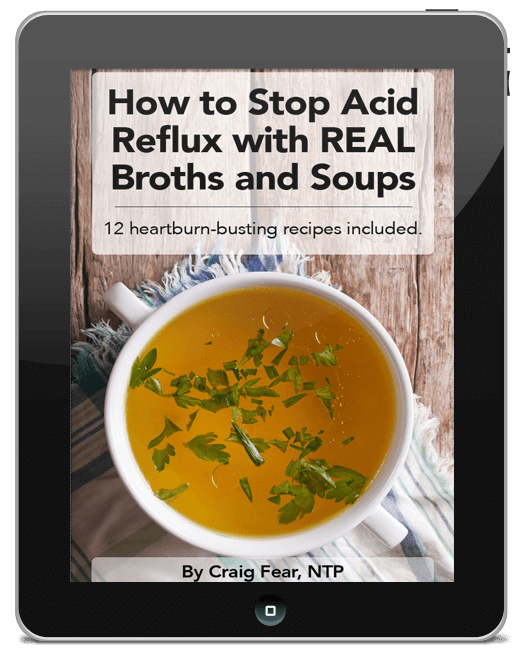 Add back to the soup and stir well. Taste and add a little more, to desired sweetness. Add 1 TBSP each of lime juice and fish sauce. Taste and add another TBSP of each, if desired. Pick out the lemongrass, galangal and kaffir lime leaves, if using. It helps to use some sort of slotted spoon. Alternatively, you could tie them up in cheescloth or a spice bag for easier removal. Personally, I think their flavors infuse better when they're not tied together. Add Thai basil leaves and mix well for about another minute. Puree everything together until smooth with an immersion blender. Add shrimp and simmer until cooked through, 4-5 minutes, optional. Serve with steamed white rice on the side or add rice noodles to individual bowls, optional. Ladle into individual bowls and allow each person to add any additional seasonings, to taste. Parts 4-6 – Coming Soon!